It always seemed to be sunny during my visit to Tibet, and this day I explored what it was like inside the Potala Palace was no exception. Initially, it was an eye opener for how the trip began. We departed from the resort, driving on the wrong side of the road for about 100 yards until we reached the intersection to make a U-turn. The local drivers swerved out of the way as if this was the natural way to drive. If I had pulled this sort of thing anywhere in the United States during my road trip across the country, there’s no doubt in my mind that there would’ve been a 5 car pileup. But luckily, today I was in Lhasa and luck was on my side. 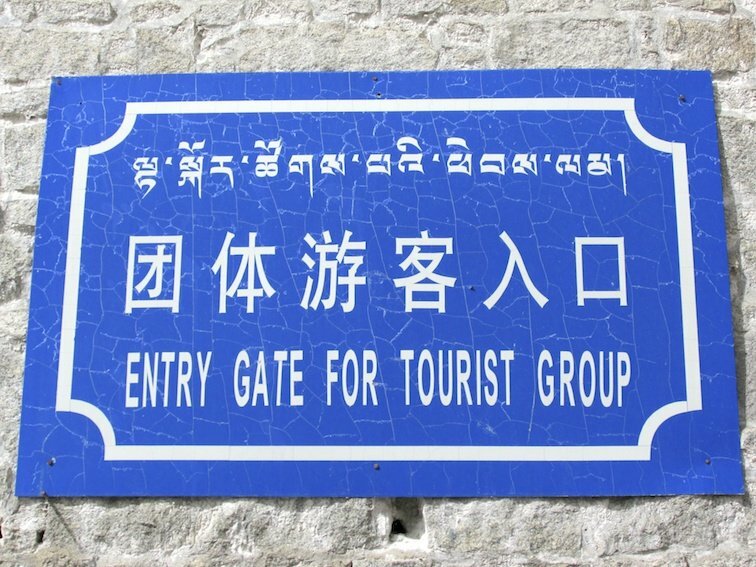 Pulling up to the curb on the correct side of the road, my fellow travelers and I that had chosen to go with Budget Tibet Tours to visit Tibet unloaded from the van and began to walk up to the main gates of the Potala Palace. Security was tight, something I found to be custom around this area, so most of my gear including my backpack was left behind with the exception of my camera. There’s no way they were taking that away from me! Passing through the main entry gate and purchasing the tickets, we walked through the garden leading to the museum’s entrance. The flowers we saw along the way bloomed vigorously against the shining sun. Shades of yellow, blue, red & every other color of the rainbow made everyone walking through feeling welcome. The sweet aroma they gave off really tied it all together. 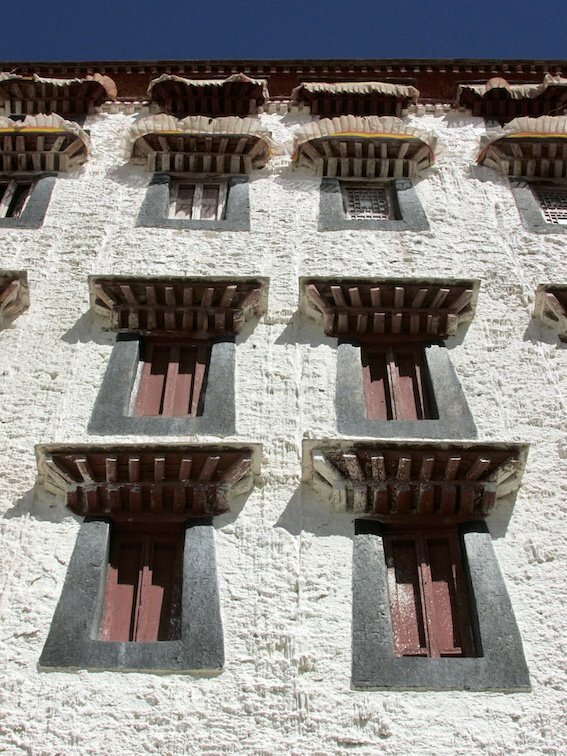 Arriving at the base of the Potala Palace, the aged white bricks towered high above me with painted shadows of red over the windowsills. In the center of the entire structure stood a blood red building that was known as the Red Palace. Surrounded by that were two yellow buildings that are actually the courtyards connecting the main palace to the White Palace, shrines & many of the other 1,000 rooms. Making my way up the steep stairs, the rise in elevation took a very obvious effect on our breathing. Even the guide seemed to be struggling with the hiking in this high elevation. You really don’t come to terms with how massive the place is until you start the ascent up. At that point, I might as well have been climbing to the base of Mt. Everest. Getting a closer look at some of the Tibetan architecture, I really appreciated the unique scriptures written into many of the blocks although the paint job had been a little rough; splattering bits of white paint over the windowsills and their shutters. Once we reached the main door it was time to turn off the cameras out of respects for the temples but, before walking inside the Potala Palace, I managed to get a few shots of the entrance. 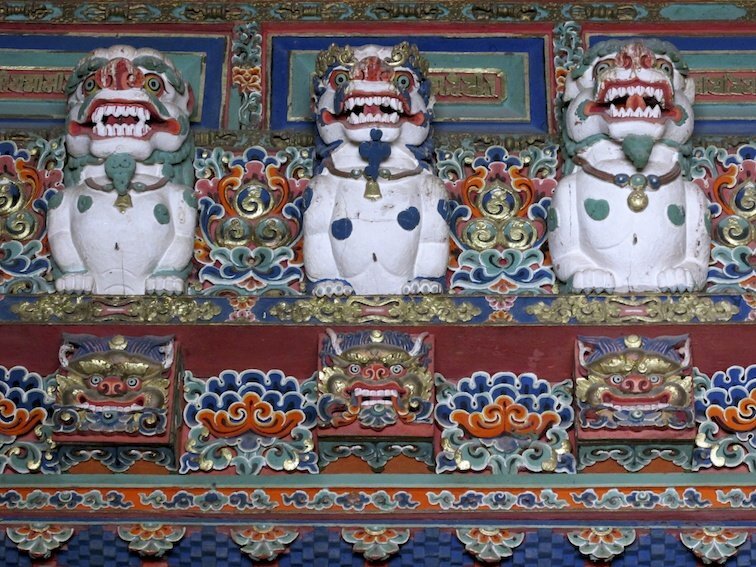 One of the many Gods were painted on the surrounding walls to protect the Palace. At the very top of the thick, wooden red doors were these ferocious looking white beasts snarling at their visitors. 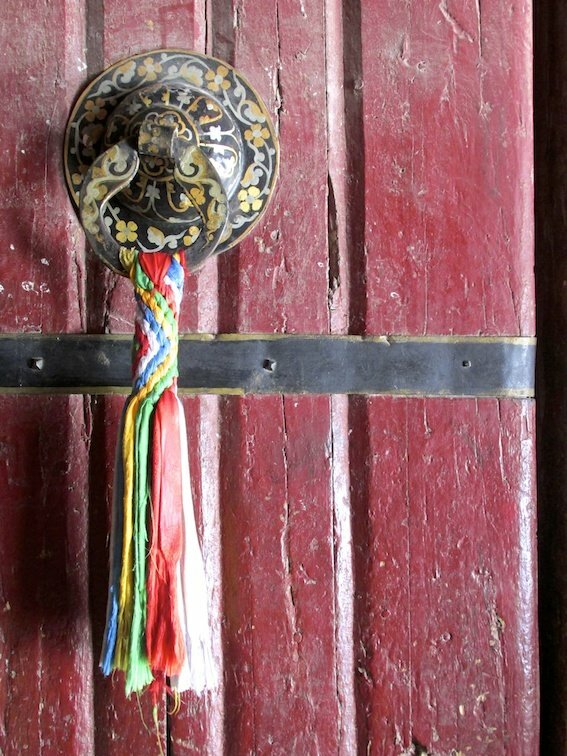 The door handle itself was a like a ring with some colorful Tibetan cloth weaved onto it. Walking through the door, as instructed, I turned off my camera and began to look around. At first, it was quite bare, with nothing more than washed yellow walls on either side and a slim wooden border painted of the typical Tibetan architecture butting against the roof. That quickly changed as our tour guide walked us through a small courtyard, up some steep wooden stairs and into the first of many rooms we were to visit. 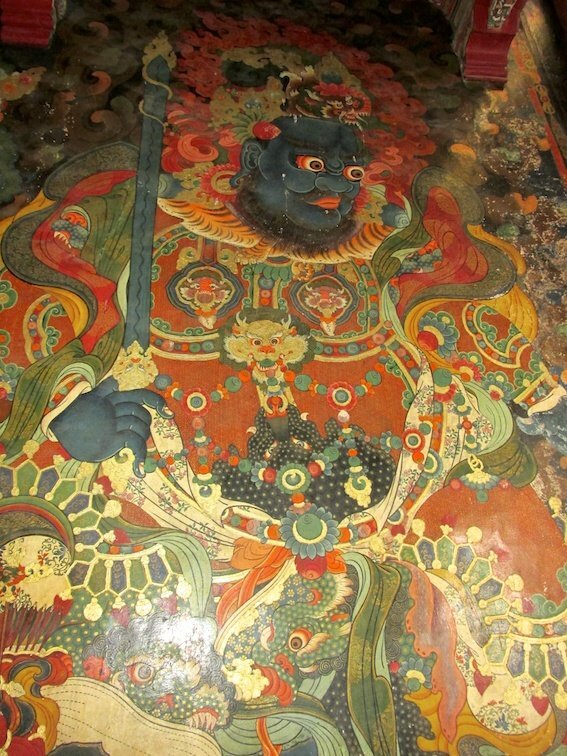 Inside the Potala Palace was a collection of superb murals, miniature copper & gold figures as well as various other statues representing the typical Buddhist religious figures similar to those I had found at the Grand Palace in Bangkok. 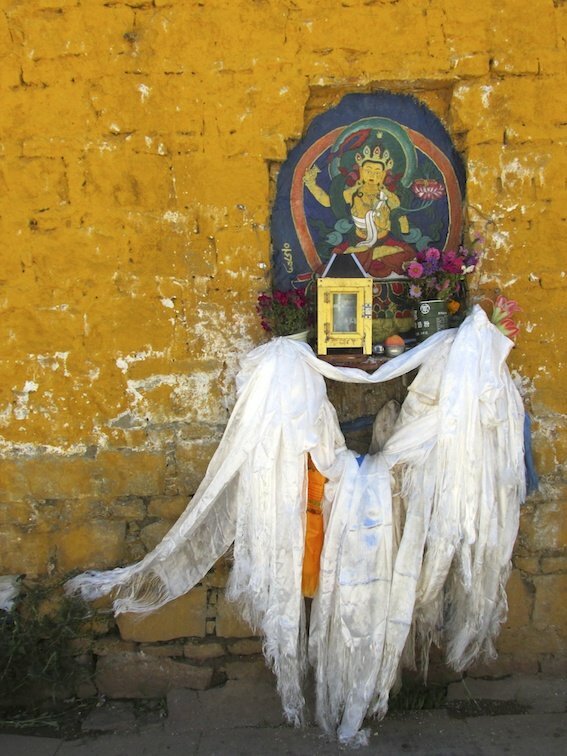 Surrounding the statues lied a thin glossy white cloth called a kata from which I was told represented the highest form of purity of intention and aspiration in the Tibetan religion. The rooms leading through the Red Palace only got more interesting as we walked on. Chapel after chapel, the large rooms were filled with giant gold-painted figures representing Dipankara (Buddha of the Past), Shakyamuni (Buddha of the Present), and Maitreya (Buddha of the Future). Passing through more study rooms, chapels, and other halls, we arrived at the end which stood the tomb of the 13th Dalai Lama. Stepping outside, the group and I were greeted with a fantastic view of Lhasa. The air seemed much cooler and cleaner at this elevation than it had in other cities through China. Walking down the long steps, we took our time getting back to the van and was encouraged to take a few more photos of the surrounding streets. I was even lucky enough to have found this Tibetan family who allowed me to take a picture of them during their family trip to the Palace. All in all, the entire palace (museum) was very beautiful and I would highly recommend anyone to go there if they get the chance. 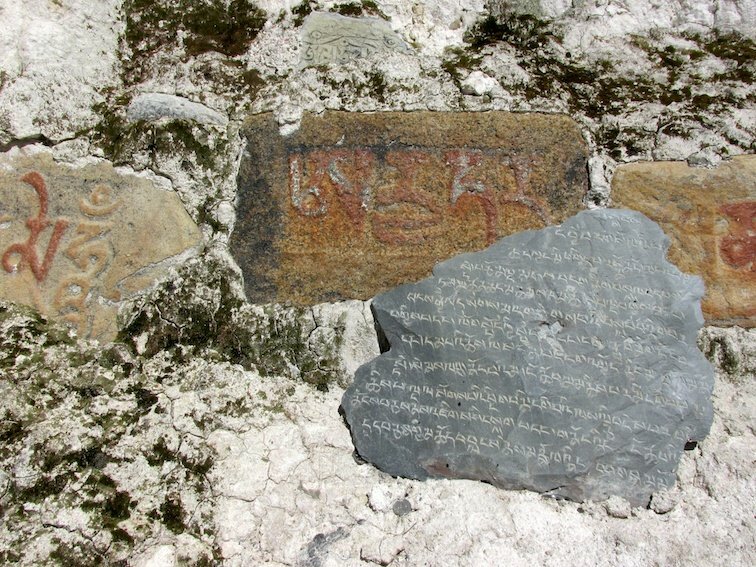 Despite China’s overrunning authority growing on their homeland, the Tibetan people are still as friendly as can be and are more than willing to welcome you into their home country to explore the temples and learn about their culture. 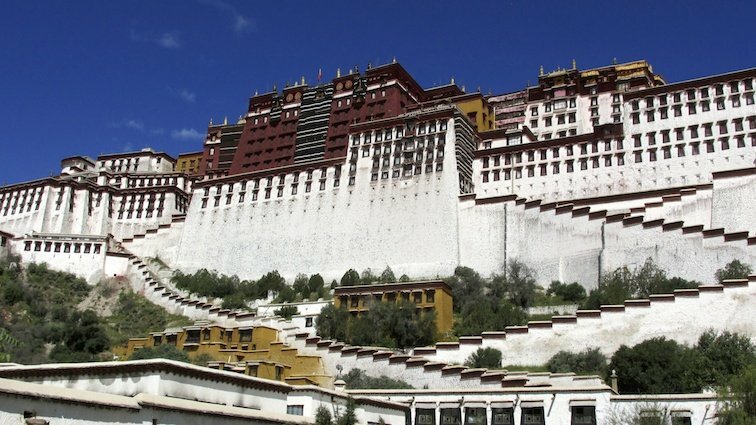 How much would you like to explore the outside and inside of the Potala Palace Tibet? Wow, gorgeous! I can imagine that walking up all those steps at that altitude must be difficult indeed – just today my partner and I ascended 1000m to around 3,600masl to do a hike and that was pretty hard, even though it’s not the highest altitude we’ve been at here in South America. I love how serious the guy in your last photo is while making the peace sign. Hilarious! Haha thanks Sam…I thought the same thing when I saw his face…lol. And yes, it is so beautiful in Tibet! Amazing! Can’t wait to go there one day. That view at the top is a great reward for having made the climb up. The view is what would get me to the top! Heck, the view is what will get me to Tibet :D! Thanks for the inspiration! Wow, that first picture of the palace makes it seem so intimidating! I had no idea it was that massive. Yeah the Potala Palace is quite massive. There are over 13 stories of buildings: 1,000 rooms, 10,000 shrines & somewhere around 200,000 statues! WOW, Tibet! I love the family picture. I so want to visit one day! Wow, man! Tibet is a HUGE dream of mine, and I could stare at that artwork for hours, just admiring the color and intricacy. 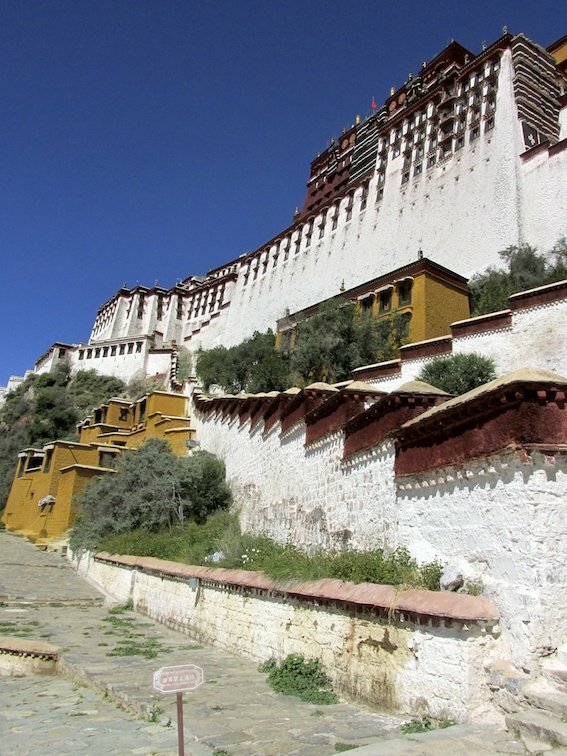 Sounds like the Potala Palace would be an incredible place to explore. The Potala Palace was, indeed,quite an incredible place. The only downfall was the amount of time we had to explore it; it was very commercialized and being how old the place was it could only hold up to 200 people at a time therefor limiting our time inside the place. All in all though, I’m extremely happy I was able to visit it! 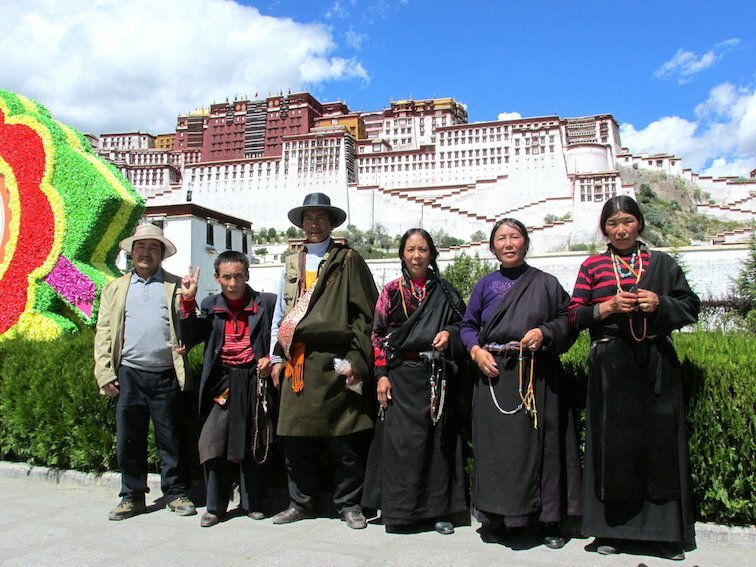 Looks like a great tour–I would love to visit Tibet! 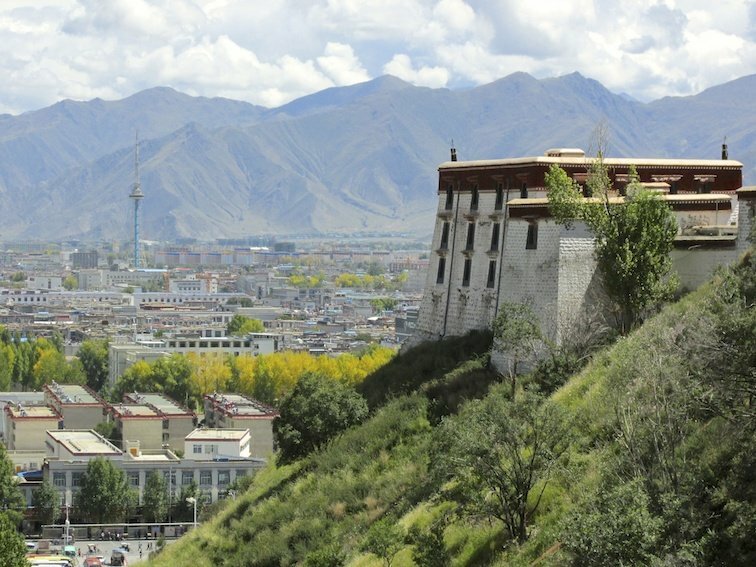 The Potala Palace looks stunning, especially the views from the top–definitely worth the climb! Such fascinating architecture, I love all your photography. Tibet is somewhere I long to visit, I imagine it would soothe my soul. I hope you make it out there soon Charli, the Tibetan way of life is quickly disappearing due to the Chinese overwhelming the country. Love the photo of the Tibetan family, especially the poker-faced peace signer, so at odds with everyone else standing to attention! The first thing I noticed when I looked at the photo is those stairs- they do look a big like MT Everest! Haha. beautiful place though the colours and the art work is incredible! Oooo I can certainly relate to being active in high elevation! Good job 😉 What beautiful collection of photos you have here, too. Everything about this experience oozes history and architectural genius. I know that Tibet is probably not on most peoples tips of their tongues when it comes to such beautiful palaces/monasteries but this really is spectacular and I would love to explore further. Tibet is of course intriguing and this just enhances its reputation in my mind and encourages me to visit here soon! I’m sure that there are a plethora of landmarks like this worth visiting so thanks for sharing this and really taking my mind into overdrive as I consider a future trip here! Absolutely incredible Ronald!!! Tibet has always been on the top of my destinations and this post really helped to increase the wanderlust! That should be Dalai Llama instead of Dalia Llama. Brought back fond memories of my trip there in June 2007. Inside the Potala Palace we were asked by some of the monks if we had seen the Dalai Llama in Dharamsala in India (where we come from) and started conversing in broken English about life in Tibet and India. 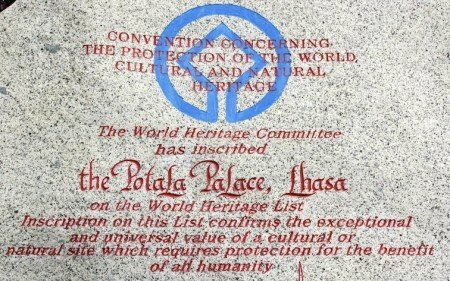 Potala Palace is on my to-visit list, but if/when I go, I do not expect to start so many sentences about it with present participle phrases. Viz: Reading this report, I began to be irritated by the grammar — even though the descriptions interested me.